SAAT M.Tech Counselling 2017 (शिक्षा ‘ओ’ अनुसन्धान विश्वविद्यालय काउंसलिंग) is going to be conducted by Siksha ‘O’ Anusandhan University in fourth week of June. 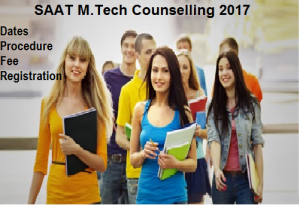 All the eligible candidates who qualify successfully in SAAT M.tech 2017 will be further called for SAAT M.Tech Counselling Schedule. Other than this the University will also call the GATE qualified candidates for SAAT Counselling 2017, where the admission will be done on the basis of the GATE score. Candidates must appear for SAAT M.Tech Counselling Procedure at its University campus on the specified date. Therefore applicants can now check more details of SAAT M.Tech admission below. SAAT admission 2017 will be carried out completely on merit basis in the entrance exam and even on the basis of valid GATE score. Eligible candidates whose name appears in the merit list will have to attend SAAT M.Tech Counselling Process in order to get admission into the desired course. SAAT M.Tech 2017 Counselling of will be conducted at Siksha ‘O’ Anusandhan University Campus. The filling of choices will be done via online mode through the website. Applicants must make payment of the admission fees via demand draft in favor of Siksha ‘O’ Anusandhan University”, payable at Bhubaneswar. In case seats are available after the counselling session, then all the seats which belonged to reserved category, PH and women category will be converted to general category. Applicants who fail to report for counselling round will not be considered for admissions. SAAT Seat Allotment will be conducted for qualified candidates by Siksha ‘O’ Anusandhan University after the counselling Process. The seat allocation procedure is completely based on the basis of candidates rank, choice of course and availability of seats. All the eligible candidates who are provided their respective seat must submit the admission fee. Siksha ‘O’ Anusandhan University is going to conduct SAAT Counselling 2017 in the month of June. Through the counselling Process, applicants will seek admission into M.tech courses. Therefore to receive the latest updates of SAAT M.Tech Counselling Process, keep visiting our portal and we also notify you the details of upcoming Engineering PG Entrance exams.